I’ve written here about Marissa Mayer before, when she took the helm at Yahoo. And now with a broad reversal of Yahoo’s telecommuting policies (communicated through the HR mouthpiece), Mayer has earned a spot again. “…it was perplexing to see Yahoo! CEO Marissa Mayer tell employees who work remotely to relocate to company facilities. This seems a backwards step in an age when remote working is easier and more effective than ever. Even within our own industry, the decision was met with mostly criticism, backed up by recent infographics, studies and surveys that seem to indicate that working from home is a boon to productivity. - A Stanford study, conveniently released on the same day as Yahoo’s memo, reported that call center employees increased their performance by 13 percent when working from home. They also reported “improved work satisfaction and experienced less turnover,” according to the study. - A Bureau of Labor Statistics study, also from last year, reported that working remotely “seems to boost productivity, decrease absenteeism” — that means missing work — “and increase retention.” It also gives employers more incentive to ask you to work on weekends, the authors say. Recruiters far and wide think it is a great idea for Yahoo to suspend remote working. (More candidates in a very tight-tech market means more money in our pockets). But there are some who quietly support the decision. It even extends to Yahoo! insiders, who state the the lack of productivity is a company issue, rather than a telecommuting issue. While working mothers and recent Yahoo! hires (for whom working from home was a sizable perk) vent their frustration at the double standard this imposes on parents struggling to balance work and home life (Mayer reportedly had a nursery built for her six-month old in her office), some grudgingly admit that this may be more about business and less about punitive and petty freedom grabbing. As much as people love to hate on Yahoo for its many missteps, it’s hard to believe one of the planet’s most intensely scrutinized CEOs would enact such a policy just because she wants to lord over a campus full of cubicle drones. “I think Marissa Mayer is way too smart for this to be the ultimate resolution of whatever challenge they’re facing,” says Tony Schwartz, the founder and CEO of The Energy Project, a consultancy to Fortune 100 companies that advocates for a more flexible workplace culture. Even HR analysts are buzzing on various social networks about the possible reasons for Mayer’s perplexing decision. Laurie Ruettimann writes that it may be a smart way to consolidate power. Others speculate it’s a layoff disguised as a policy change to get rid of surplus workers. Insiders at Yahoo hope it will separate the truly productive from those who have been riding the gravy train of a mismanaged tech behemoth. 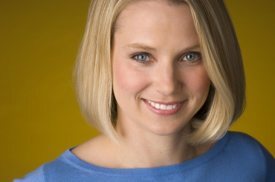 Mayer didn’t create the culture at Yahoo! but she’s inherited it, along with all of the dysfunctions that go with that says Uberflip founder who does not allow his employees to work from home. It has never been easier to work with people across different time zones, schedules or work environments—which explains why approximately 30 million Americans currently work from home at least one day a week, according to the Telework Research Network, and why regular telecommuters will number 4.9 million by 2016, representing a 69% increase from today’s level. Work is not one-size-fits-all—and forcing it to be may put your company on the road to extinction.